The huge Whale Shark is the largest known fish on this planet. Contrary to what its name suggests, the whale shark is not actually related to whales in any way, except for its sheer size. The Whale Shark is a filter feeder and is gentle and docile around humans. There are apparently very few places in the world's oceans where the Whale Shark appears regularly and this includes the Galapagos Islands. They can grow to around 18 metres long and can weight up to 15 tons sometimes more. 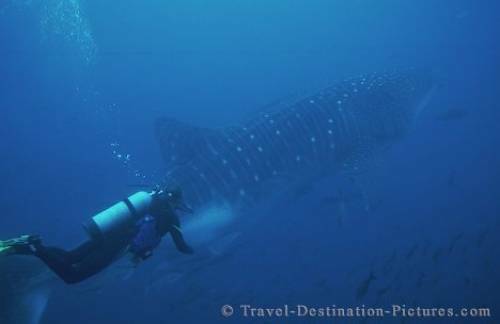 Diving in the Galapagos is a breathtaking experience especially if you are fortunate enough to come across a Whale Shark. Picture of a diver dwarfed by a massive whale shark in the Galapagos Islands, Equador.